Can you believe that I am 30-years-old and I've never made Rice Krispie Treats? The simplest thing in the world to make, that toddlers can make them (with adult help on the stove, that is), and I've never made them! Why you may ask? Well, to be perfectly honest, I'm not a huge fan of Rice Krispie Treats. Never really have been for some reason. I've always found them to be too dry and boring. Every time I tell someone I'm not a fan, they look at me like I have a few heads. Rob included! Rob loves them, and when he asked me to make some with Cocoa Krispies for a family reunion I figured, "sure, why not. I don't really have a lot of time to make much, but of course I'm taking something." While at the store I picked up the ingredients I needed, all two of them, and whipped these up while preheating the oven for dinner. 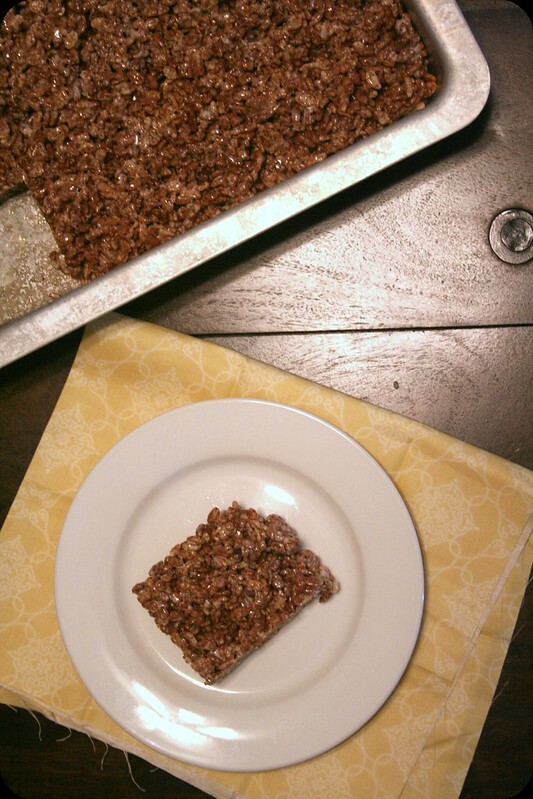 I still don't really like regular Rice Krispie Treats, but made with Cocoa Krispies - yes please! These were fantastic, quick and easy. I know many people have made these over and over again and don't really need a recipe, but maybe someone reading is like me and actually needs to look the recipe up! In a large sauce pan, melt butter over medium heat. Add marshmallows, stirring until completely melted. Remove from heat. Prepare a 9x13 pan by spraying with cooking spray. Using a butter spatula, evenly spread cereal mixture in prepared pan. Allow to cool before cutting and serving.